Oli has posted screenshots and a description of the MTA:SA Deathmatch Admin System. Issue 82 of PSW magazine has a review of LCS PS2 in which they mention that it has no multiplayer or any new features, just slightly better graphics than the PSP version. I didn't expect it to have multiplayer because it wasn't in development for very long and it will be selling for a budget price. Vice City Stories will be released on PSP in October 2006. Not really surprising. Vice City was the obvious choice and it will be much easier to make than a whole new city. I hope it means they'll have time to add some online features but maybe they will save that for GTA4. 2006-05-10 - SA-MP v0.1 is out! SA-MP v0.1 has been released! The PS3 controller will be like the dual shock 2 controller but without the shock (no rumble). The controller will be slightly lighter than a dual shock and it will have some basic motion sensors. 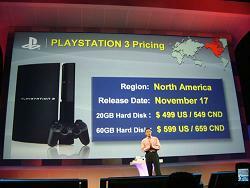 There will be two PS3 models released. A basic model with a 20GB HD for $499US and a luxury model with a 60GB HD, memory card slots, wi-fi and HDMI for $599US. gtagaming.com has posted some more information about the conference. Vincent is creating a 2D top down car game in LUA script . It will be compatible with the PSP and Windows versions of Lua Player . Don't expect a full clone of GTA2, it's just going to be a simple top down game but it could still be fun. SA:MP Beta #3 was released to the public for a short time but it has been deactivated now. It appears it had a few problems. CheatDevice 1.0d has been released. Cars are now able to drive on walls.